The next day, however, he reports that the money is gone. Hishuru Tori (Hayakawa), a wealthy Japanese admirer (changed in the film's 1918 re-release to a Burmese ivory king named "Haka Arakau"), overhears and offers her a loan, if she is willing to pay the price of her virtue. The same day, her husband is jubilant that his gamble has paid off. She asks him for $10,000, which she explains is to cover her losses playing bridge. She visits Tori and tries to pay him back, but he refuses to cancel their bargain. She threatens to kill herself, but he is so confident that she is bluffing that he hands her a pistol. When she continues to resist his advances, he subdues her and brands her on the back of the shoulder with the seal with which he marks all of his property. Edith grabs the gun and shoots him in the shoulder, then flees. Richard, having followed her after she left their home, finds Tori and picks up the gun. He is held for the police by Tori's servants. When questioned, he confesses to the crime to protect his wife. When Edith visits him in jail, Richard orders her to remain silent. During the trial, both he and Tori testify on the stand that he was the shooter. However, when he is found guilty, Edith rushes to the judge and announces she did it. When she shows the brand to all, the judge and officers of the court have great difficulty keeping the outraged spectators from attacking Tori. The judge sets aside the verdict, and Edith and Richard depart the courtroom. Upon its release, The Cheat was both a critical and commercial success. The film's budget was $17,311. It grossed $96,389 domestically and $40,975 in the overseas market. According to Scott Eyman's Empire of Dreams: The Epic Life of Cecil B. DeMille, the film cost $16,540 to make, and grossed $137,364. Upon its release, the character of Hishuru Tori was described as a Japanese ivory merchant. Japanese Americans protested against the film for portraying a Japanese person as sinister. In particular, a Japanese newspaper in Los Angeles, Rafu Shimpo, waged a campaign against the film and heavily criticized Hayakawa's appearance. When the film was re-released in 1918, the character of Hishuru was renamed "Haka Arakua" and described in the title cards as a "Burmese ivory king". The change of the character's name and nationality were done because Japan was an American ally at the time. Robert Birchard, author of the book Cecil B. DeMille's Hollywood, surmised that the character's nationality was changed to Burmese because there were "not enough Burmese in the country to raise a credible protest." Despite the changes, the film was banned in the United Kingdom and was never released in Japan. The film inspired French film critics to coin the term photogenie to specify cinema's medium-specific qualities and was filmed with innovative usage of lighting that helped raise awareness of film as a serious art form. The film was nominated for the American Film Institute's 2001 list AFI's 100 Years...100 Thrills. The film was remade in 1923, with George Fitzmaurice as director and Pola Negri and Jack Holt starring. 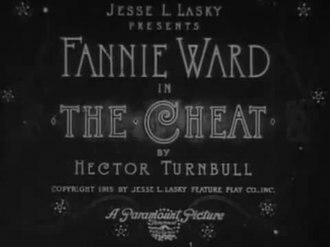 In 1931, Paramount again remade The Cheat, with Broadway mogul George Abbott as director and starring Tallulah Bankhead. The Cheat was also remade in France as Forfaiture (1937) directed by Marcel L'Herbier. This version, however, makes significant changes to the original story, even though Hayakawa was cast once again as the sexually predatory Asian man. A copy of The Cheat is preserved at the George Eastman House. This surviving version is the 1918 re-release footage which includes changes to the Hishuru Tori character. The Cheat, which is now in public domain, was released on DVD in 2002 with another DeMille film Manslaughter (1922) by Kino International. ^ a b c d Eyman, Scott (2010). Empire of Dreams: The Epic Life of Cecil B. DeMille. Simon and Schuster. p. 113. ISBN 1-439-18041-5. ^ a b c Eagan, Daniel (2010). America's Film Legacy: The Authoritative Guide to the Landmark Movies in the National Film Registry. Continuum. p. 49. ISBN 0-826-42977-7. ^ a b Birchard, Robert (2004). Cecil B. DeMille's Hollywood. University Press of Kentucky. p. 70. ISBN 0-813-12324-0. ^ "2002 Kino on Video DVD edition". silentera.com. This page was last edited on 11 April 2019, at 11:42 (UTC).